Shuangcheng District (simplified Chinese: 双城区; traditional Chinese: 雙城區; pinyin: Shuāngchéng Qū) is one of nine districts of Harbin, the capital of Heilongjiang province, People's Republic of China, covering part of the southwestern suburbs. It sits approximately 42 kilometres (26 mi) south-southwest of downtown Harbin. Formerly a county-level city until 15 May 2014. 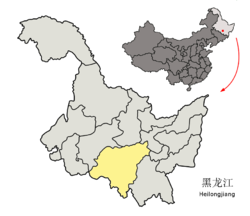 The westernmost county-level division of Harbin City, it borders Daoli District to the north, Nangang and Pingfang Districts to the northeast, Acheng District to the east, and Wuchang to the southeast, as well as the Jilin prefecture-level divisions of Changchun to the south and Songyuan to the southwest. ^ Google (2014-07-02). "Shuangcheng" (Map). Google Maps. Google. Retrieved 2014-07-02.